Fish and Tonkatsu broth for the Ramen at Gumshara, Haymarket, Sydney NSW. Thinly sliced delights ready for the grill - Madang, Sydney NSW. 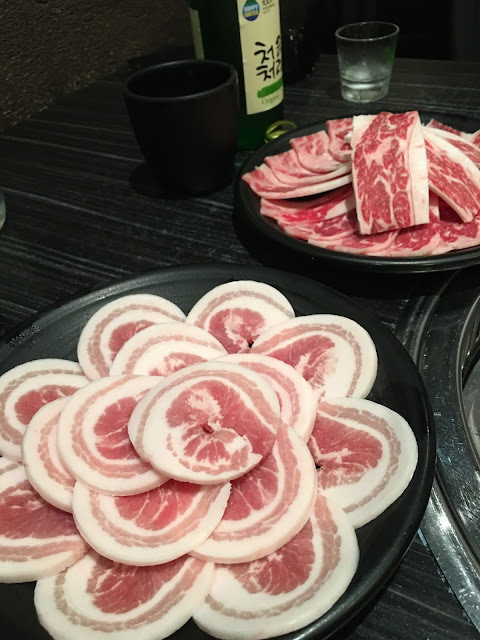 The Samgyeopsal, or unmarinated pork belly, in the foreground, assures of a good cut from the butcher. It can be an eye opener watching how the Korean staff handle the hot metal and containers holding the burning coals, all right in front of you. The unavoidable smoke form the ambers and cooking is best handled sitting outside - they evoke the rather harsh winters form the countries of source. With a contrast of cold and heat, the people who gather instinctively huddle closer, with barriers broken down, deeper understanding gradually achieved and the food in front of them tasting better. Omelettes, pancakes and potato noodles can be viewed as rustic food but offer all-in-one wonders combining aromatic ingredients. They provide sustenance, enhance the flavours due to the pan fry approach and is street food on the go. I often find my mates and I fail to finish this category of food on a dining or lunch table as our attention gets diverted to other offerings. I must say wholesome food such as this is never to be under estimated, especially on cold days and when lots of physical exertion occurs. The other practical dish is the Bibimbap, a bowl of every thing, including meat, veg and sauces. I always love a quick lunch of the Japanese rice bowl or Don - whether with Tempura, Katsu or with grilled eel. And how does a diner counter all this seeming heat and grill? One can first think of the cold brews that best accompanies Japanese and Korean food - whether they have labels like Hite, Kloud or Sapparo, it is best to get these on tap or from a refrigerated store. The drink routine is critical, for it sets the pace, frees up discussion and facilitates sharing moments. The audio crescendo of the place rises with each drink consumed, but the tone becomes more informal and relaxed as well. How does an intern maintain composure, circumspect and manners as seniors provide an atmosphere not otherwise seen at work? Shochu is fermented usually at 25 percent alcohol from various options like barley, rice, buckwheat, brown sugar or even sweet potatoes. Hailing from Kyushu, the brew is weaker than vodka but provides more oomph than wine or Sake, which is made solely from fermented rice. The Koreans have their own version called Soju. The other mitigating factor are the cold serves that can come as entrees or sides. Sobas in the Japanese islands and Naengmyeon in the Korean Peninsular may have a common origin, but the presentation is different, distinct and both delicious. The Koreans stir mix a chilli based sauce on to the vermicelli, topped by hard boiled egg and cucumbers. The Japanese view the noodles as the centrepiece and I reckon there is always a Zen like presence in served Soba - brought to you on a wooden board, they signify minimalism like a garden of carefully designed stone layouts, with a most enticing egg in a side bowl. Sashimi Bento selections, Shellharbour Stockland, NSW. The significant component of raw items in northeastern Asian menus signal the importance of freshness in food eaten. This was an early and strong manifestation of the slow food movement and the need to reduce the distance between source and consumption. Long before the organic and simple foods campaigns of the past few decades, the culinary style was concocted in a more natural world far from processing and manufacture, with the salmon and tuna were out there by the sea shore or riverside near the village. The epitome of Korean freshness may be is the Sannakji, which implies having live and moving octopus on your plate! The penchant for guests sitting beside a long bar counter not only mitigates the question of space in more crowded societies, but also allows the transparency of diners watching front up on how their food is prepared. This available intimacy means one who consumes can relate better to the other human being who prepares and cooks. It allows building up a relationship and so increases the chances of having regulars come back for meals. It also echoes the nuance that eating is not an experience to satisfy the palate, but rather that it is part of a more holistic occasion to give eye contact, test the aromas, hold a conversation and enjoy the texture of food up close. Naengmyeon is served with an iced broth; slices of boiled egg, cold boiled beef, lightly pickled radish, Korean pear and cucumbers; red chilli paste; vinegar garnishing; spicy mustard oil or sauce; and thin noodles. The ambiance of the hearth, the security of being around familiarity and the essence of reassurance perhaps can be best symbolised by the warmly served dumpling. A gulp of the fillings, whether prawn, pork or veg, within the tenderly folded casings, once placed within your mouth, makes one recall the gentle things in life, the touch of puppy fur and the exquisiteness of good fabric. Gyoza and Mandu are accompanied by carefully made sauces that are often soy based, tempered with slices of heartwarming ginger and which provide a dipping routine that does not over power the palate. The mildness of this entree dish then gives way to the grilled effect of meats later on, or the sauciness of Shobu-Shobu, the Nippon hotpot, or the Korean Jeongol. And then there is tea, with a whole complexity of intricacy if one delves into the sophisticated, allows the palate to explore and enjoys beyond the mere act of consuming the nuances of tea leaves. The higher levels of tea sipping experience may seem to be complicated to an outsider, but each measured step, pause and proper lift of hand have meanings that soothe the soul, encourage the appetite and honour the culture. Tea can be rice based and flavoured, as popular in Japan, or brewed with Ginseng, a root so much respected in Korea for its properties and meaning. 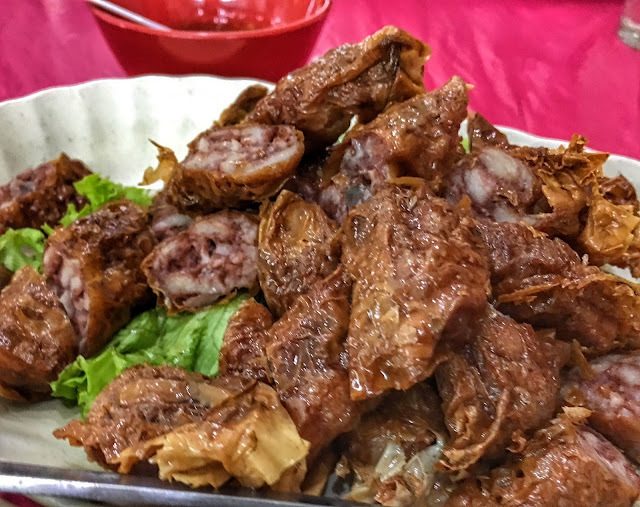 North-east Asian cuisine also can be as simple as deep fried seafood balls or Yakitori, or as sophisticated in making the vinegar flavoured rice for wrapping with the delectable slices of raw and carefully chosen fish, Sashimi. North-eastern Asian culture encourages and nurtures partaking food on a communal basis. Snacks to share together or eat one's self include breads, which in Japan have fillings that range from melon, pork cutlets, red bean paste and curry sauce - Pan. There are also stews, braises and desserts that are meant to get neighbours and family to sit down together. The cultural and ethnic backgrounds of Japan and Korea do differ, although they can share common factors in their cuisine. The freshness of salads from Western backgrounds contrasts with the pickles and preserves presented as Korean Banchan entrees (as in cabbage chilli preserved Kimchi) and Japanese sides (think of Tsukemono or "fragant dish"). Japanese can be said to be more subtle in their food, due to the predominance of rather fiery taste chilli paste used in many Korean dishes. Seaweeds, red beans and soybean are loved ingredients in both cultures. Soups in Korea tend be beef or rib based or laden with a rice cake base, whilst Japanese soups are favoured with Miso, Shio or Shoyu. There is a Korean sausage roll called Sundae while the Japanese take pride in their Wagyu (which literally just means 'Nippon beef"). Korean noodles or Guksu tend to be served in three categories - hot, lukewarm and cold. Apart from Soba, Japanese noodles are served piping hot, like Udon and Ramen. The use of dainty chopsticks is an expected feature, although the traditional Korean ones are made of copper. Japanese chopsticks are often more colourful but shorter than Chinese ones. You can also observe that chopsticks in Japan have rounded ends, in China squared ends and in Korea more rough ended. Koreans provide you with chopsticks and a metal spoon at the table, with no folks. Aussies give you folks and knives, with no spoons. Thais offer you both folks and spoons. Small ladle spoons are given to individual diners for Chinese meals, while it is all right to best show appreciation by drinking your Miso soup straight up the mouth. The Japanese concept for a taste (as opposed to Western concepts of sour, sweet, salty and bitter) like Umami echoes the unobvious, the subtle and the unforgettable sensations on our palate which escapes definition. It is akin to savoury, but that does not totally capture its intent in meaning. Across from Kyushu island, the Korean soy paste of Doenjang does capture this Umami flavour. Both cultures do emphasise on presentation and layout for the customer. Meat is sliced finely instead of being given a whole chunk piece on your plate. The offering of freshly picked vegetables, especially lettuce and tomatoes, is accompanied by the Western habits of dressing like Mayonnaise. You may smile at the guest seated on your right, whether along a counter bar or at the next tightly placed table. We look for the green coloured mustard paste with Nippon food or the Kimchi at a Korean joint. Staff like to adorn themselves with colourful aprons and headgear, engage in banter amongst themselves to create the effect of being down a village lane or in a Izakaya. Your food is prepared with an earnest concentration. You are truly at home, even if not every body knows your name.